I've read many of the posts regarding the Airlift and Firestone air lift kits for the rear end of the Ody. I'm considering this mod but also considering replacing the rear coil springs with more heavy duty springs. I've searched for coil spring replacements and on the Internet and I've come across replacements to lower the Ody, but I haven't found replacement "heavy duty" rear coil springs. Has anybody else seriously considered this modification? Better yet, installed it with success? I've considered it a lot, and actually asked questions about it in one thread or more here in the last month. I don't know how long you've had your Ody nor how you drive it, but it also lacks shock control (IMO) as well. There is way insignificant rebound dampening. Too high of a spring rate in the back will make that problem worse. Other potentially bad things are a rough ride when unloaded (depending on how right of a spring rate you use) and potentially unstable handling due to mismatching (assuming they were matched to start with) ratio of front/rear spring rates. I'm going with the H&R spring kit, which is a "stage 2" kit that I guess is going to be noticeably firmer than normal, though according to those here who have it, still very acceptable. It will solve a problem for me of what I think is a too-high ride height, comparing my Ody to others, and also an unloaded, nose-up attitude which seems to be the norm. It claims to lower 1.5" front, 1.1" rear, which I think would be just about right for my tastes. I've known of people in the past who have taken front springs and put them in the rear. Don't know if in the Ody this is possible or not. The H&R spring kit retails for $349, but I think is only $249 at TireRack.com. When I do that, I'll have the stock springs available to measure if you want to pursue this route. The main problem with a spring change is the finality of the installation. Being able to deflate the bags and reduce the lift on the rear end allows you to maintain the same attitude loaded or unloaded. Also, if you happen to not like the ride with the additional rate in the rear, the stock ride is just a deflation away. It really is the best of all worlds, IMHO. Also, I have always felt the the air bags take a little of the harshness out of the ride, as opposed to the harder spring approach. Just my experience. Good luck. 2014 Celestial Blue EX-L + 19" Advanti B1 wheels w/ 245/50-19 Michelin Pilot Sport A/S 3 tires, a WeatherTech cargo mat w/ added "bumper bib", a ScanGauge II and a nice large basket in place of the difficult to use front console. AirLift kit #60815 and DashMat dash cover (black to beat windshield reflection) added. Thanks for the thoughts and questions. We've had our Ody for just over 3 months and 7k miles. My better half is the primary driver and quite a few of the miles are with driver only. However, we do have a handful of sons and when we occupy most of the seats in the van and place a few intems behind the back seat, the rear end squats quite a bit. I agree that the vehicle has a bit of a nose-up attitude when unloaded. I'm not too concerned about lowering the front end - I'd like to raise the back end. I like the adjustability of the air bag kits but I'm a bit concerned about their durability and the need to keep aware of the air pressure. We intend to keep this van for 10 years. I like fixes that stay fixed and don't need attention down the road. That is the main driver behind looking for heavy duty springs. If I were the primary driver, I wouldn't have any concerns with the airbag kit - if the system needed air or there was an odd noise, I'd notice it. However, with my spouse as the primary driver . . . . . I know that I am much more cognizant of mechanical operation of the vehicle I'm driving. So, I thought I'd try a bit of research with the Ody Club members. Wayne, you offered - and I'd like to ask for your assistance in measuring the stock springs. I'm wondering if the shape (at the mounting locations) of the Ody springs are the same in the front and the rear. Also, might they be taller? Might they fit on the rear? Then there is the question of the spring rate of the front springs compared to the rear springs? (This wouldn't be as easily measured at home). With the engine and transmission up front, it is possible the spring rate is higher in the front. It is highly unlikely the answer is yes to all of these questions but it is worth checking out. Thanks, Jerry and Wayne, for your assistance! I'm wondering if the shape (at the mounting locations) of the Ody springs are the same in the front and the rear. Also, might they be taller? Might they fit on the rear? 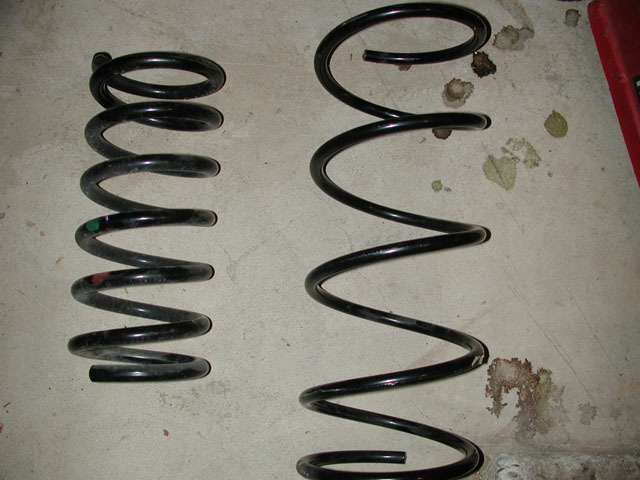 Then there is the question of the spring rate of the front springs compared to the rear springs? (This wouldn't be as easily measured at home). With the engine and transmission up front, it is possible the spring rate is higher in the front. It is highly unlikely the answer is yes to all of these questions but it is worth checking out. If I may step in, I just lowered my van with H&R springs a month ago and judging from what I saw,I beleive the front springs are wider in diameter than the rears.Don't quote me yet on that. I'll take a look at my stocks today and check on the size. Not unless my fellow "lowered" members can answer these questions. Guys ? I'm probably not going to get this done for at least a few more weeks. We're going on another road trip at the end of August, and then the usual rush to get our kids back into school. It'll probably be mid-september before I get the springs in place. Haichiroku is probably going to be your best bet. The front spring rates are almost definitely going to be higher by a considerable margin. Also, if you're not interested in lowering your vehicle, air springs may be the way to go. Jerry is very happy with his and has used them for a long time with excellent results. We're really looking to increase the handling capability of our van and increase its roll stiffness and rear sagginess. Lowering our Ody will do that, so even though the air lifts may also work well for us, we're going the spring route. We just took a trip today, with 7 people and about 150 pounds of stuff in the back recess. At the gas station, the lip of the rear wheelwell was about an inch and a half above the top of the rear tire, while the front was probably three and a half inches over the front tire. Way nose up attitude, almost as if the Ody were sniffing the air, though honestly it seemed to handle much better today than it did for us in the mountains. We didn't drive it nearly as hard because we had open buckets of clams in the back, but it also didn't feel as wallowly when doing lane changes at 75 MPH either. Hard decisions, but I for no logical or good reason at all, am more comfortable with changing out the springs than doing the airlifts. I'd pay Lucy a nickel for some psychological counseling to figure that out. Ok. Got a pic of my stock springs. Rears are on the left,fronts on the right. As you can see from the picture, very big difference between the two,diameter,height,bound and diameter of coils. Wow, from the looks of it, the rear has not a whole lot of travel, and the tight winding means a low spring rate. Do you have a shot of what the H&R springs look like? Do you have a shot of what the H&R springs look like? Unfortunately I didn't take any shots of the H&R before the install. The longest I had a set of AirLifts on a vehicle was thirteen years, with NO problems, whatever. Another set went ten years, before I sold the car. I have found that a monthly air check is plenty and, since you should be checking your tire pressures at least that often, it is easy to remember. Yeah, Wayne, I really hate to drive in the "uphill all the way" mode. I think the rear suspension does have little travel and relies upon that soft rubber bumper to do a lot of the "suspending" with a load onboard. Thanks much for taking the time to photo and post your springs. Wow. Significant difference. Swapping the front springs to the rear doesn't seem the way to go. You have been most helpful. I don't care for the nose-up attitude either, especially with any size of a load in the van. I also am more comfortable with changing out the springs rather than installing the airlifts. Your feedback that you have used Airlifts for 10 years and for 13 years is most comforting. I've been wondering what life people have received from the suspension air bags. I'm not sure what way I'll go. However, at this time, since I haven't found a source for heavier springs, it looks like I'll need to try the Airlifts if I choose to do anything. Following up on this thread . . . . I installed the Airlift 1000 kit yesterday. Information on other posts was most helpful. Hopefully, the airbags will be durable. Time will tell. Sorry to dig this up from the deep dark past....as it's been almost 6 years....I was wondering how the "durability" factor was still high?? Apparently the Firestone bags are problematic regarding fittings/leakage whereas the Airlift 1000 are very reliable without leakage issues. Air Lift Bags for Rear of First Gen?